The ACC-FPV90 wire management clip is made of corrosion resistant 304 stainless steel, which makes it a durable, long lasting and reliable solution for all environments. The ACC-FPV90 is easy to install and slides 90 degrees on to module frames of various thicknesses. The ACC-FPV90 accommodates 1 to 2 PV cables up to 8.0mm in diameter. 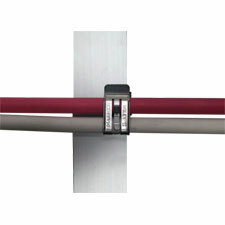 The rolled edges are designed to help protect cable insulation from damage. ACC-FPV90 clips are the perfect solution for keeping the PV installation neat, clean and free from ground faults. specifically designed to work together and engineered to meet stringent, accepted quality standards allowing the user complete confidence in the integrity of the connection.